As the title of this blog post states, we earned $705,846 in our first year in the online course business. This is a real number and not inflated or exaggerated in any way. The purpose of this blog post is to give you an in-depth look into our first year with our online course business. I’ll be showing you screenshots, the actual sales numbers, our marketing approach, and things that we learned along the way. My goal is to show you what is possible with an online course business, but also inspire you to consider an online course business for yourself. As you can imagine, we’re big believers in online courses and they are a tremendous business opportunity for the right person (or couple in our situation). First, let’s get started with some introductions. 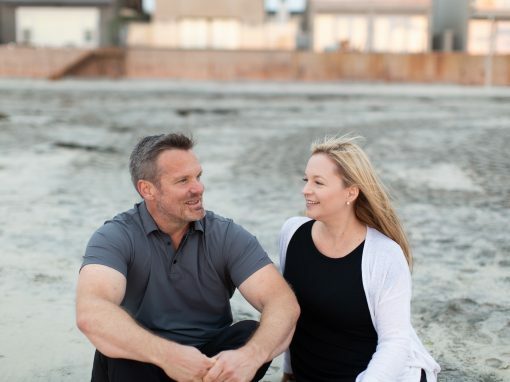 My name is Pete Reese, and along with my wife Heather Reese, we run our own highly successful online course business. We teach about Blogging, Travel Blogging, and also now about how to prosper with online courses. Heather has been a blogger for over 12 years on our site ItsALovelyLife.com writing about lifestyle, travel, and all things family fun. 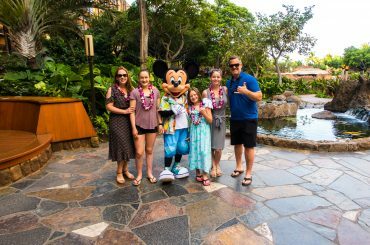 Heather has been a pioneer in the blogging world and specifically working with brands and travel partners to make blogging a profitable business. Her level of success increased steadily over the years to the point where the blog itself was bringing in about $30,000 in income through various sources. In addition, we travel on average about 150 days a year to amazing destinations all around the world due to our travel blogging. My background is mainly Real Estate and financial services. 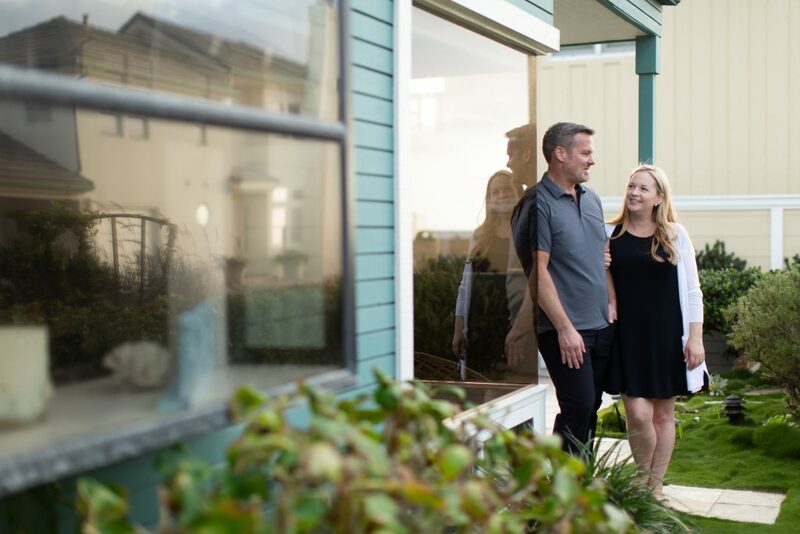 I’m a licensed real estate broker, and for many years, I ran our own successful brokerage in San Diego specializing in investment properties and luxury home sales. For years, Heather ran her blog and I ran the real estate business. But the momentum of the blogging business soon became obvious to both of us. I was helping more and more with the business side of the blog and at the beginning of 2017, we decided it was the perfect time for me to make the leap, and make the move to working on the blogging business full-time. The blogging business is a fun, unique, and potentially a very profitable business. Anywhere we went, Heather was always asked by people how they could do the same things we were doing. We knew there was a big need for blogger training, and Heather always knew she wanted to help people on a large scale. It soon became our goal to help as many people as possible get their own blogs started and show them exactly what they needed to do to create the type of lifestyle they wanted for themselves. My goal became to take Heather’s blogging expertise, and find a way to reach as many people as possible with an online course. In March of 2017, we launched our first free course, called the Start A Money Making Blog 5 Day Crash Course. This is 5 days of intense instruction that shows how to get a blog started the right way and set up as a business. At the same time, we launched a Facebook group called Start A Money Making Blog. The idea of this group was to provide a welcoming place where we could interact with new bloggers, answer questions, and show what was possible with blogging. 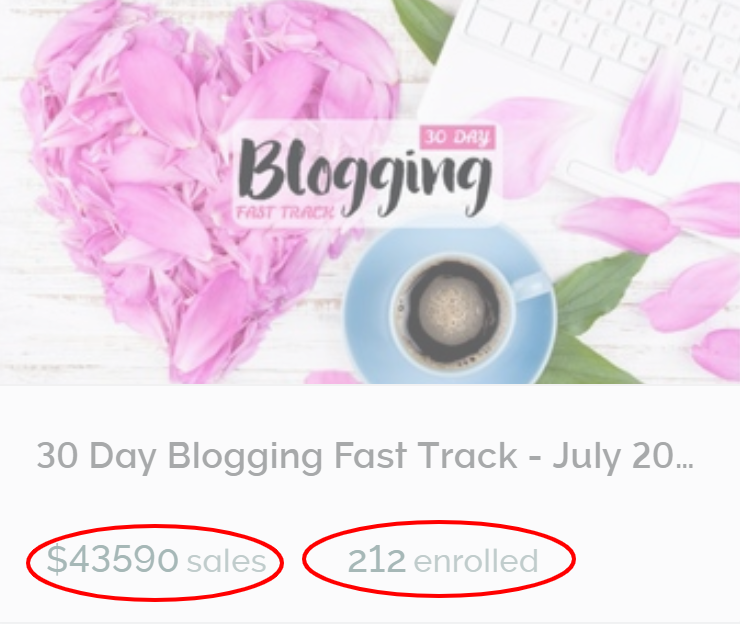 We gave away the 5-day crash course, we answered questions and built relationships within our Facebook group, and we began building our premium blogging course called the 30 Day Blogging Blastoff (formerly called the Blogging Fast Track). All the information for the course was in Heather’s head due to 10+ years of blogging experience, endlessly reading message boards, trial and error, and all of her experiences along the way. But, it was an extensive process to take the information, organize it into an online course, and create all the content and the support systems that went along with that. The interesting thing about creating our first premium course is that we really had no idea what we were doing. Yes, we read all we could find on the internet, but it ended up being a bunch of random puzzle pieces and the big picture was cloudy, to say the least. Luckily, we did enough things right and finally opened up the doors to our first course on June 19, 2017. We made an announcement to our Facebook group and to our email list, and like magic, the sales started coming in. I have to say that this was an AMAZING feeling. It was validation that our students really appreciated our content and that they trusted us to provide them more great content in the course. We were confident we would enroll students, we just didn’t know how many enrollments to expect. After the dust settled on our very first course launch we had 212 Course enrollments for a total of $43,590! At that point in time, we knew that there was a whole new world in front of us and we were just scratching the surface of what was possible. To be honest, I’d often find myself with a calculator crunching numbers, obsessing on how to improve our course, and how to streamline our marketing processes. The structure of our first course is pretty simple (although very unique). Every 30 days we start a new course for that month. That way our students can go through the material together and interact. It’s not just an online course, it’s an interactive experience (more on that later). What resulted was a new course launch every month. It really taught us a lot and QUICKLY! We learned what worked and more importantly what didn’t work. We also added a second premium course to our portfolio in November 2017, called the Travel Blogging Fast Track. This was a logical add-on for us because about 50% of our blogging efforts are related to our travel blogging. Travel blogging is an exciting and very specific area of blogging which required its own course to properly teach bloggers how to become professional travel bloggers themselves. This involves free (or even paid) trips to destinations around the world, so it’s an area we are always asked about and knew there was a need for quality training. 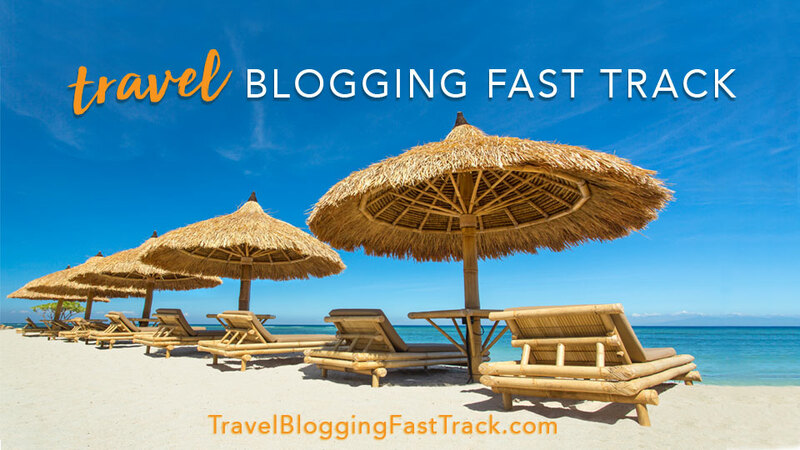 The Travel Blogging Fast Track has been very popular and a great addition for us! When all was said and done, after 1 year of our online course business we earned $705,846. This is from June 19, 2017 (our first course sale) to June 18, 2018. Above is a screenshot from our Teachable dashboard. 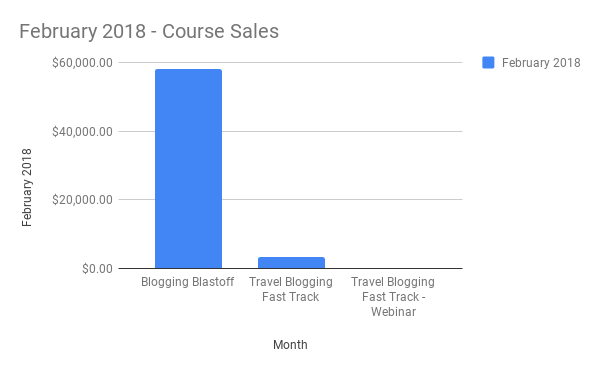 $705,846 represents course sales for Blogging Blastoff and Travel Blogging Fast Track and that is after we paid any affiliate commissions, payment transaction fees, and refunds. The best part is that course enrollments accelerated considerably in the 2nd half of our first year. 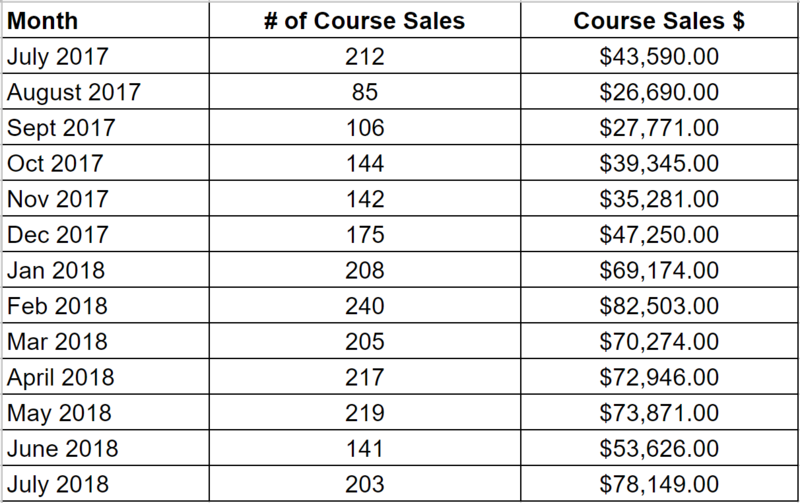 We’ve already earned well over $1 MILLION in course sales and we’re on track to at least double our course sales in our 2nd full year. I’ll keep you updated HERE. So, how did we do it? What did we learn along the way? If you are more of a numbers person rather than a graph person, here is the spreadsheet with the actual figures. Keep in mind, this is the actual amount we received after any credit card processing fees, affiliate payments, and/or refunds have been deducted. The figures above are the number of dollars we actually received during that month. Some of our students opt for a payment plan instead of paying a discounted upfront amount. Therefore, all of the funds are not received the moment the student enrolls in the course. For Blogging Blastoff, we are always enrolling in the month before the actual course occurs. 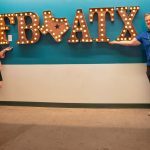 For instance, in June 2017, we were enrolling for the July Blogging Blastoff. We gradually started building momentum as we were learning on the go. Notes: Since this was our first time launching a course, we really didn’t know what to expect. We were excited to see what would happen. We did a special pricing of $199 for Blogging Blastoff (formerly named Blogging Fast Track) or 3 payments of $85. This was about half of what the course costs now, but we wanted to reward our first students and also get as much momentum as possible. We let everyone know that this was an introductory price and the cost of the course would go up next month. The plan worked out great and we had a tremendous month. As you’ll see from the figures above, the numbers aren’t exactly what is shown on the screenshot earlier in this post. That is because some students purchased using the payment plan and it would take a couple of months to receive the rest of the payments due in our accounts. Also, there were some last minute sales for the July course that occurred in the first couple of days of July. Since this was our only course at the time, it made up 100% of our course sales for that month. Due to the structure of our business, we received quite a bit more in affiliate sales and sponsored content, but we are detailing only our course sales figures for the purposes of this post. We realized there was a big demand for our course and we knew we were on the right track. This was probably one of the single best months in our business life because it was validation that our concept was going to work. We just knew that we had to figure out how to get better at doing this. What made it even more interesting is that we were in the Cayman Islands working with the Visitor Bureau on a sponsored trip from June 21st through June 25th. This made things even more unbelievable because we were snorkeling, riding horses on the beach, and enjoying an amazing vacation while the course sales were happening. We actually experienced a little dip in sales for this month. Also, we raised the price to $297 or 3 payments of $125. We did offer a $50 off coupon code for the first 100 enrollments. We ended up enrolling less than half of the amount that we did for the July course. Since the cost of the course was more, we weren’t that far behind in the sales figures, but we knew we needed to do a better job for the next month. In hindsight, the reduced sales were due to a couple of different reasons. First, we weren’t as structured with our course launch and didn’t build anticipation with our audience as much as we did for the first launch. This cost us sales for sure. Secondly, we figured out sales were not just going to happen automatically. We realized that we needed to have an organized system in place building anticipation for the course launch and also taking some defined steps in order to ensure success. We relied heavily on live videos within our Facebook group in previous months and we did not do any in July. We made a big realization that sales and marketing efforts were critically important to our course sales. Sales were very close to what we did in July. We worked hard on improving our sales process and overall put more effort into our course launch. Seasonality is real! Many of our students are moms, so we were up against Back to School. So, even though our processes improved, we did little to increase our course sales due to the focus for many of our students on other things in life. Sales started to increase this month, versus the month before. We realized the power of creating a system. Our launch for Blogging Blastoff was pretty much exactly the same as the month before. This freed up a little time for us to work on other big projects (working on the Travel Blogging Fast Track course). Sales increased slightly, but not a noticeable difference. Again, seasonality came into play here as many seemed to be focused on Halloween and school sports instead of blogging. We were beginning to think that maybe we had maxed out our monthly income for Blogging Blastoff. Again, we didn’t do much to change our launch process. 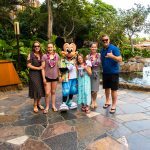 We became super focused on getting the Travel Blogging Fast Track done because we knew this would be a way for us to increase our monthly income. 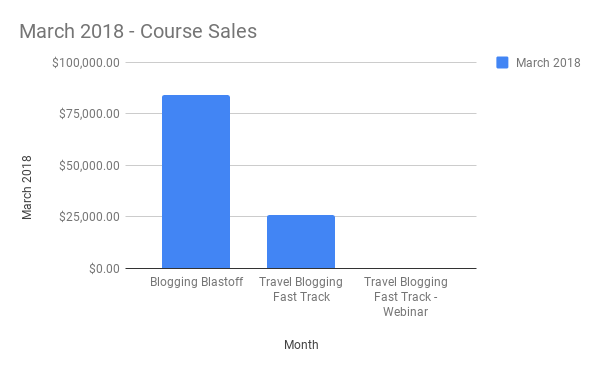 Sales figures for Blogging Blastoff increased slightly, but we got a big boost because we launched our new course, the Travel Blogging Fast Track, at the end of the month. It’s much easier to increase sales when you have two complementary courses instead of one! Blogging Blastoff sales took a big step forward and we almost achieved $50,000 in sales for the first time. The price for the January Blogging Blastoff was increased $50 to $347. 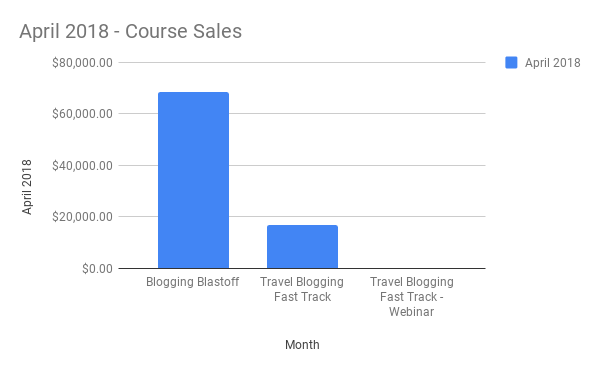 Travel Blogging Fast Track sales were minimal. We learned that the beginning of the year was really important for our niche. People are excited about the opportunities of a new year and this was the perfect time for them to start a new project. We resisted raising the price of our course, but it turned out to be the right move as revenue increased. 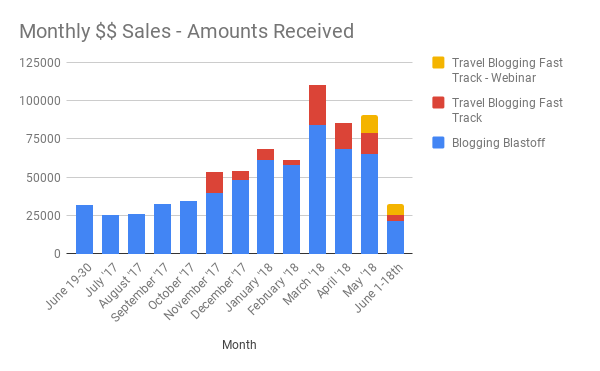 Due to the minimal sales of Travel Blogging Fast Track, we knew we needed to start working on a system to produce regular sales. This is an evergreen course (no course launches), so we begin looking into webinars as a tool to bring awareness and sales for the course. Another big step forward in sales of Blogging Blastoff at over $60,000! 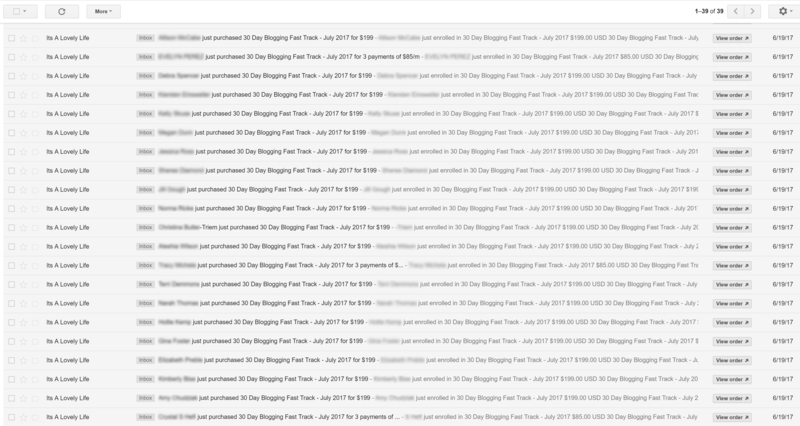 Again, the sales of Travel Blogging Fast Track were not what we had hoped. 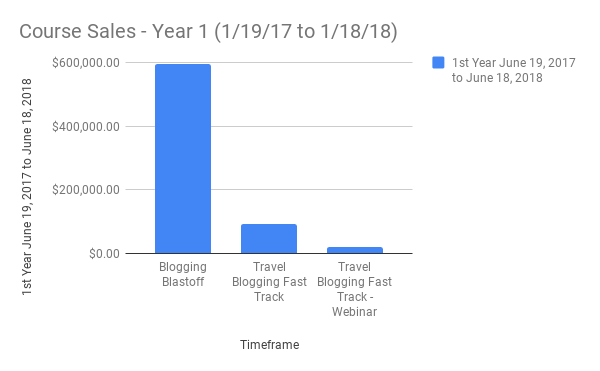 We were worried about the February launch of Blogging Blastoff, but we shouldn’t have been! This was our best launch yet. It was time to get serious about putting an automated webinar together for the Travel Blogging Fast Track. Sales of this course were not going to simply happen without making some changes to our sales process for that course. We had been receiving amazing reviews and feedback about the course and students were seeing results quickly. We knew we just needed to make more people aware of the course! 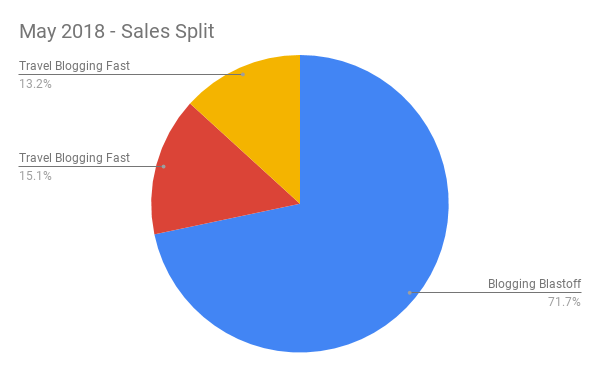 Blogging Blastoff sales were pretty similar to last month. We didn’t enjoy going backwards slightly, but at least it wasn’t much. 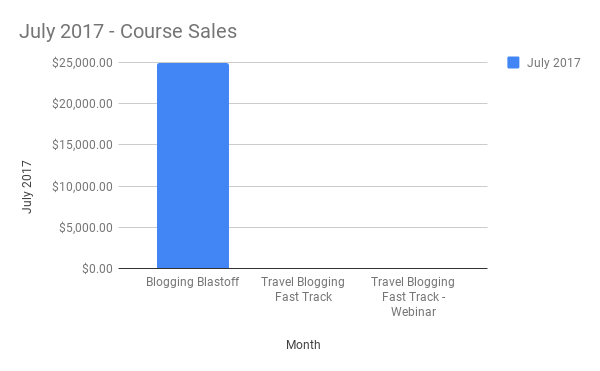 Travel Blogging Fast Track sales were slow again. We didn’t want to flatline our sales, so we decided to turn up our ad spend on Facebook and Instagram. Although results are not immediate with increases, we were pretty confident that we would see the results in the next couple of months. We felt some urgency to do something different for the Travel Blogging Fast Track. It was clear that sales were not improving, so we worked harder on our webinar (it took us a while). 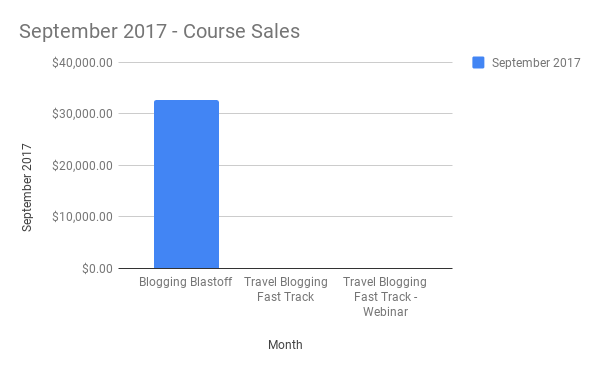 Blogging Blastoff sales hit a new high this month! 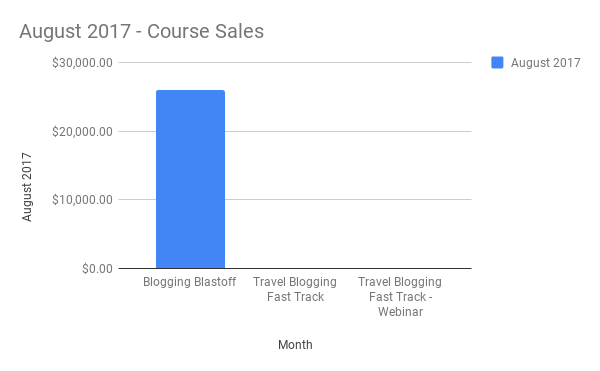 The Travel Blogging Fast Track came back to life with our best month in sales yet. Our overall sales for the month topped $110,000!! 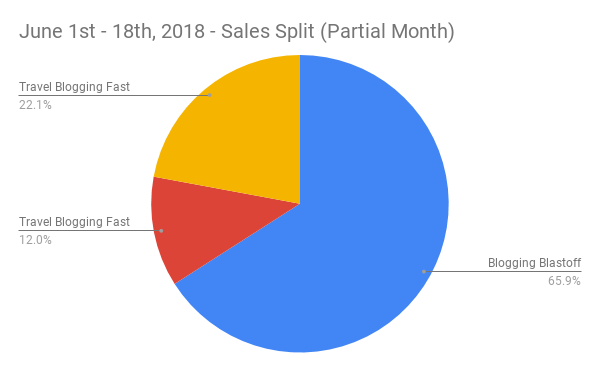 Sales were so high this month partially because the April Blogging Blastoff launch was really solid and that we were beginning to receive cumulatively more payments each month from previous launches. 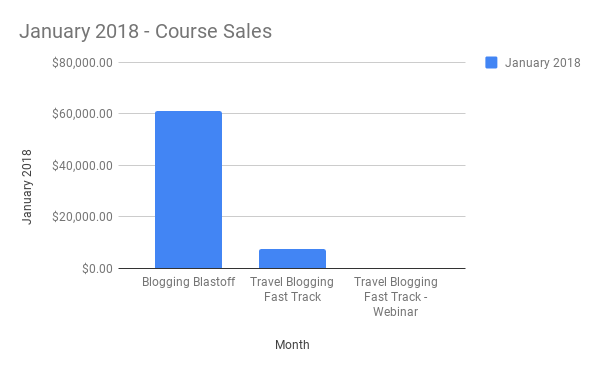 Since our Travel Blogging Fast Track webinar was not completed yet (we were still working on it), we decided to do a flash sale which had a huge impact on sales for the course. We realized we had to give a reason to buy now in order to achieve better sales. In reality, that is the concept behind all course “launches” which tend to make them more successful than having a course available for sale at all times. Total sales took a little bit of a dip this month. 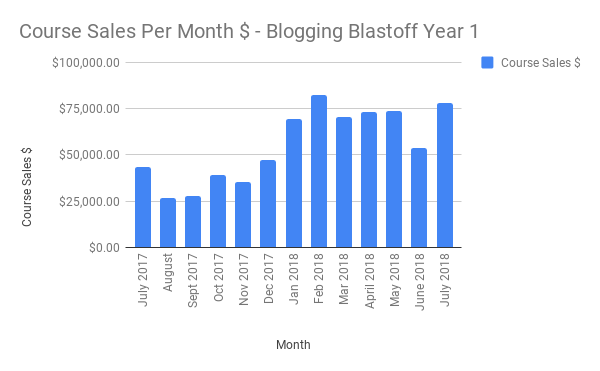 Blogging Blastoff sales were solid, but fell a little short of the month before. 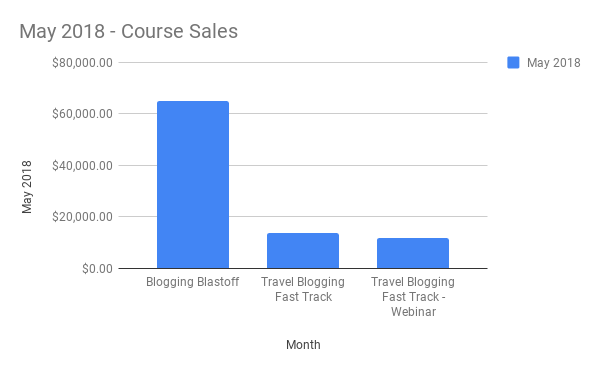 Travel Blogging Fast Track sales were a little less than last month, but still respectable. We ran another flash sale on the course as our webinar was not completed yet. Although our sales processes were getting more refined each month, we realized that each month cannot be your best. Sure, it would be nice, but it isn’t a reality in most cases. We decided to trust in the process and continue to push forward. Sales were solid this month again, but not record-breaking. We finally launched our new Travel Blogging Fast Track evergreen webinar! 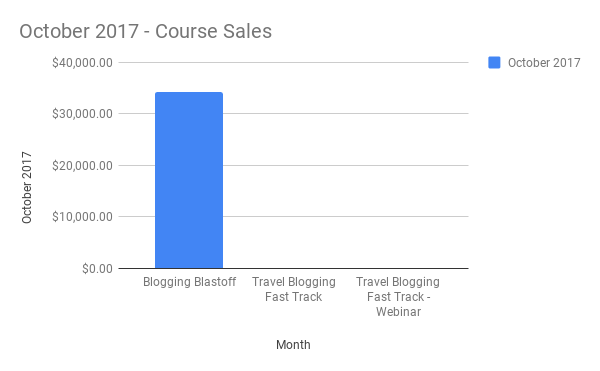 Our Travel Blogging Fast Track webinar showed a lot of promise based on the initial data. We knew that with some tweaking that we could improve its profitability and increase sales considerably. 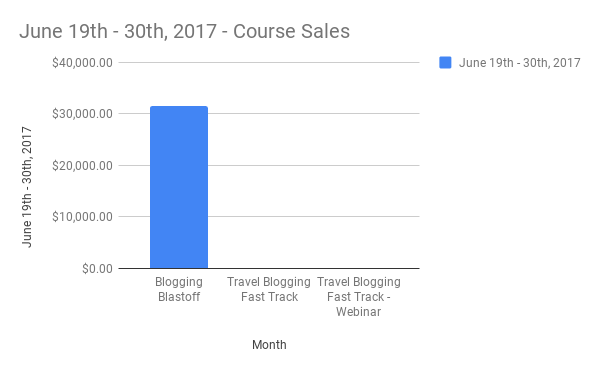 Combining the new webinar and a flash sale, this was a great month for the Travel Blogging Fast Track. 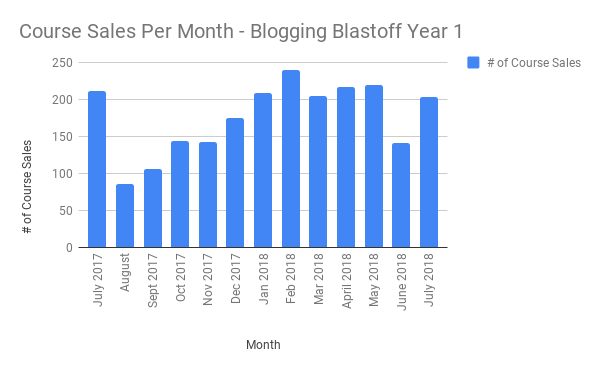 Blogging Blastoff sales were a little flat this month. We felt we were competing with summer coming up which contributed to the slight sales decline. This was just a partial month of figures above since our first year of course sales started in the 2nd half of June 2017. 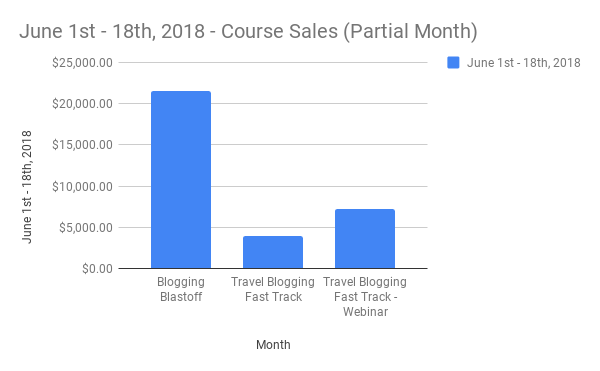 Regardless, when the month was finished it was a very solid month for Blogging Blastoff and the Travel Blogging Fast Track. We couldn’t believe that we could learn so much in one year and we couldn’t wait to apply all of our knowledge to year 2! And, to finish things off, here is a big picture look at our course Blogging Blastoff. 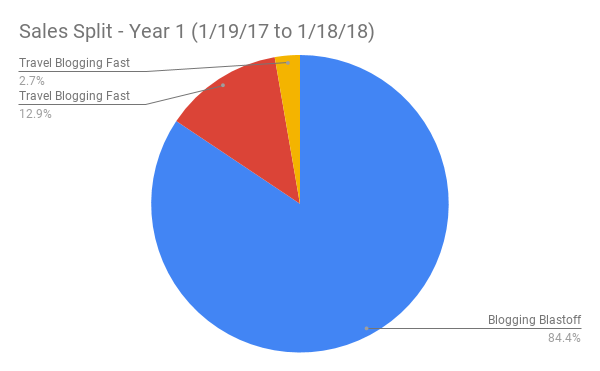 These graphs (and spreadsheet) do a great job of showing our progress each time we launched the monthly course. 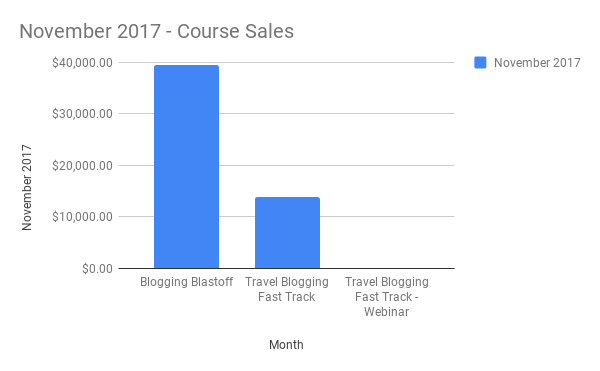 The above chart illustrates the course sales per month for Blogging Blastoff in dollars (rather than # of courses sold). Lastly, above is a spreadsheet comparing the number of course sales and dollar amount of those sales. Again, this is for Blogging Blastoff only for the first year. 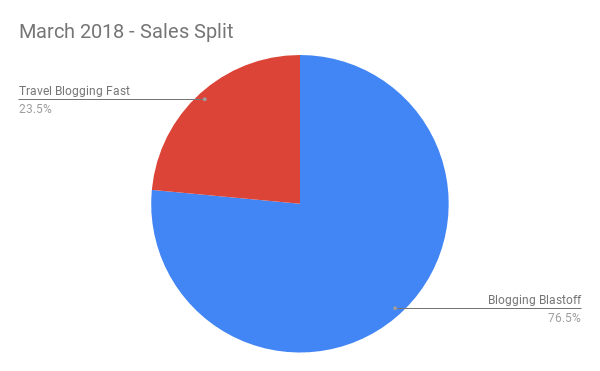 In July of 2018 (launch happened in June 2018), we were able to almost double the amount of sales $, while actually having slightly fewer student enrollments. This was because the cost of the course doubled from the initial launch of $199 to the July 2018 pricing of $397. Progress was not a straight line! As you can see, the general trend was upwards, but we didn’t automatically get more sales each month. The point here is to not get discouraged when everything isn’t as perfect as you hoped. There WILL be ups and downs, just focus on the general trend. There is some seasonality in our niche. We heard this from others before, but we experienced it ourselves. The beginning of the year (and the first quarter) were very active for us and we can’t wait to apply what we learned into the first quarter of 2019 to really multiply our results. This amount of income from our new online course business has changed our lives considerably. I have to admit, we were doing well financially before our online course business, but after it has been up and running for over a year now, we are at a whole new level. Money can’t make you happy, but it certainly can make a lot of things in life a lot easier. It’s allowed us to seek out the best possible medical care when we need it, donate to causes that are important to us, and continue to invest in our business to grow it to greater levels. We have a NEW mission. 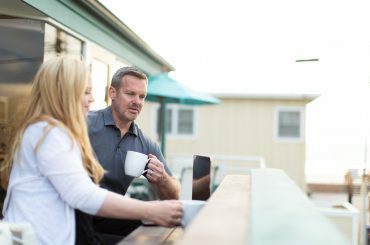 We’re spreading the word about the online course business and helping others get their own businesses started. Our lives have changed forever and we KNOW there are so many others that can create a similar business that can provide life-changing income and financial security. This article was meant to show you what is possible and give you the confidence that you need to set up your own online course business. But, this is just the tip of the iceberg. There are specific steps you need to take as well as a focused plan you need to follow in order to make this happen. We’re here to help you along in the process and show YOU the way to create a business like this for yourself. The first step is to enroll in our Create A Profitable Online Course That will walk you through the steps of creating your own online course business. The best part is that we are giving it away for FREE right now. This isn’t your typical free “course” that is a pdf of some basic information. This is a comprehensive course (videos and text) that will walk you through all the steps needed to set yourself up for success. As part of the course, we have a private Facebook group that is there for support and a way for us to personally help you on YOUR journey. This is a BRAND NEW course launched in November 2018. JOIN US NOW WHILE IT IS STILL FREE. Honestly, I wish we would have had this information before we started our online course business. It would have saved us an amazing amount of time and also helped us avoid some big mistakes that cost us time and MONEY. Here’s an important point that I need to make before you move on… Creating an online course business is something that YOU can do too. You don’t need to be an EXPERT in a subject to create a profitable online course. You just need to be more knowledgeable than those you are teaching. In fact, some of the worlds’ leading experts in any given subject may end up being the worst teachers because they can’t relate. They may not be able to properly show their students how to get the results that they desperately seek. The other thing that is important to note, is that pretty much everyone has a skill set or area of expertise that would be perfect for an online course. What are your hobbies? What is your passion? What do people always ask you about? Do you know someone that you could partner with that has knowledge in a specific area? Want to take this a little further and see if this could be a great fit for you? Enroll in Create A Profitable Online and let’s start working on it together! Remember to join the private Facebook group if you really want to multiply your results.